Brian K. Vaughan and Fiona Staples’ multiple Eisner and Hugo award-winning New York Times bestseller SAGA returned with the beginning of its fourth arc this week and has instantly sold out at the distribution level. To meet demand, Image Comics is sending SAGA #19 back to press for a one-time-only second printing. The breakout series that has captivated critics and fans across the board and garnered much mainstream acclaim from coast to coast continues the story of star-crossed couple Alana and Marko, their young daughter Hazel, and the warring interplanetary forces that threaten their survival. "Man, this is the best. I can't tell you how much Fiona and I appreciate the support readers and retailers have given our book," said Vaughan. "We'd hoped that taking a short break after each arc to let new readers get caught up on trades before picking up the monthly issues would help us gradually expand our audience, but we never dreamed our scheme would be this successful, so thanks again. Not to be greedy, but Robert Kirkman has vowed that if Saga ever outsells Walking Dead, he'll let me shave his beard and weave the clippings into my own personal hairpiece, so can we please make that happen?" Staples added: "We're so grateful to all the readers who share Saga with their husbands, wives, friends, roommates, grandparents, and nieces and nephews of appropriate age. It's stunning to see that the word is still spreading. Massive thanks to retailers for getting the book into everyone's hands." In this eagerly anticipated new issue the couple embark on new adventures—but not without adding a few more enemies on their trail. SAGA #19 has completely sold out at the distributor level, but may still be available in comic stores. It is currently available digitally on the Image Comics website (imagecomics.com) and the official Image Comics iOS app, as well as on Comixology on the web (comixology.com), iOS, Android, and Google Play. “Selling out is always kind of bittersweet, especially on a title as popular as Saga,” added Stephenson. “We want this book to be as widely available as possible, for as long as possible, but even with the third volume of the trade paperback outpacing the first two in sales and multiple Eisner nominations for the second year in a row, it’s clear we’re not getting as many copies to our retailer partners as they can sell. 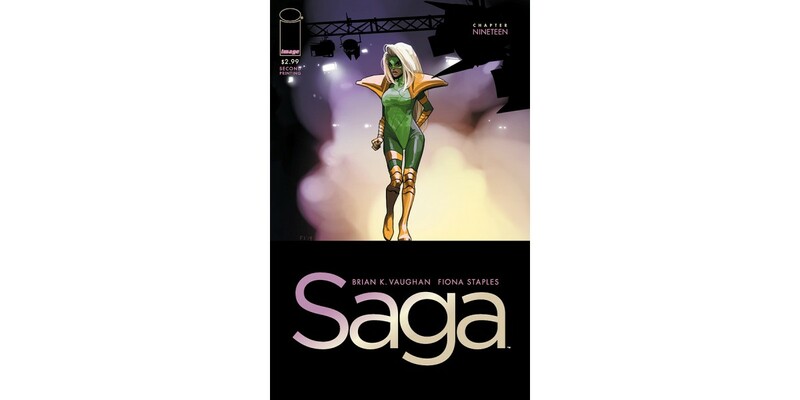 Image Comics is sending SAGA #19 back to press to satisfy customer demand, and this one-time-only second printing (Diamond Code APR148258) will be available on 6/25, the same day as SAGA #20. SAGA #20 is available now for pre-order with APR140593.